It's vacation season! Who's excited? Tomorrow Matt and I are headed off for a two-week vacation to Costa Rica – it's going to be a blast. We'll be by the beach the whole time and hopefully, eat lots of delicious food, swim in the ocean, try some stand-up paddle boarding, do some yoga and maybe even learn to surf. It's going to be relaxing and totally glorious. 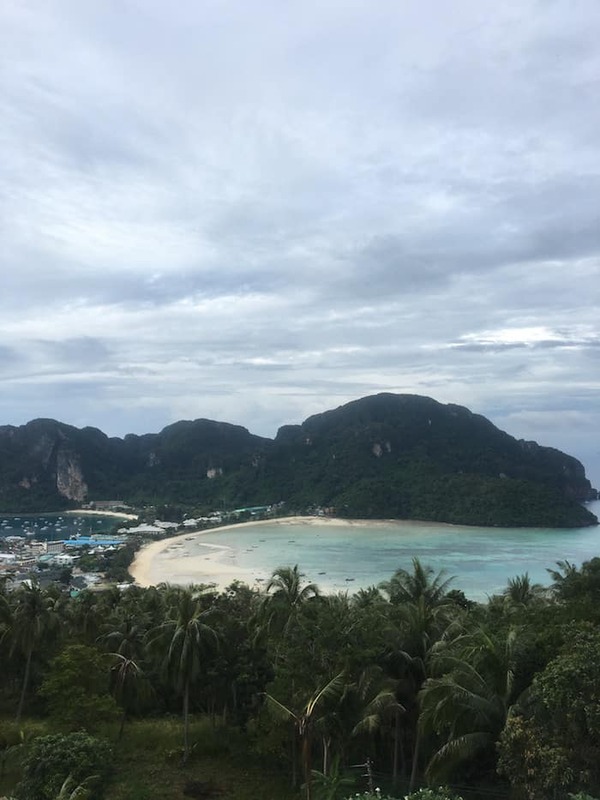 Since I know many of you are planning trips too, today I wanted to share my best tips for staying healthy while traveling. I'm taking you inside my travel bag and sharing all the products I take with me on the road. From food to beauty products and even some random things thrown in. Watch the video below to see what I'm packing! And now for a detailed look at each of these products! Trail Mix – this is one of my favorite on-the-go snacks. I make a big batch and then portion it out into little baggies to carry with me. It's energizing, filling and nutritious. The mix in the video has brazil nuts, cashews, almonds, pumpkin seeds, goji berries, mulberries, coconut flakes AND cocoa nibs. It's delicious! Homemade Granola Bars – another must-have when I travel is granola bars. I like bringing my own because it not only saves me money, but they're a lot healthier than the kind you buy. These are my Almond + Coconut Quinoa Granola Bars and they're delicious! Quinoa Flakes – while this might seem a little strange, I like having quinoa flakes with me while I travel because it helps me guarantee that I can have a filling and nutritious breakfast. You can cook them up with just hot water and add in whatever you'd like (like some trail mix or fresh fruit!). There's protein, fiber and it's gluten-free! Green Juice Powder – I love my green juices, so this is a great way for me to get my greens in even if there isn't a juice bar around. Just mix it with a little water or fruit juice and you have instant green juice. I like Garden of Life's varieties, but I encourage you to test a few out and find a variety that you like. Even try the flavors! Tea – I'm a big tea drinker (and actually don't drink coffee) so I always make sure to have tea with me. I like to bring a mix of greens and herbals so I have a few to choose from. Natural Sunscreen – I always like to have sunscreen with me when I travel! The one I have here is: Kiss My Face Face Factor (SPF 50). You'll see I also have a second one in my hand, but I actually decided against it. It was the Honest Company's sun lotion and it has terrible reviews on Amazon. Instead, I purchased these two (both of which I really like): Blue Lizard Sensitive Sunscreen (SPF 30) and Beauty by Earth All Natural, Mineral & Organic Sun Block (SPF 25). Bug Spray – bugs are attracted to me for some strange reason so I make sure to always have bug spray. The first one in this video is a homemade variety made with essential oils and the second one is from Badger. Both are all natural and chemical free! Lavender – one of my go-to oils for everyday life, lavender really calms me down. It's great for sleep too! Lemon – this is more of an energizing oil which I'll use if I need to pep up or I'll even just add a drop to my water for a little boost. Thieves – this is a great oil for traveling because its anti-microbial meaning it helps to kill germs. I carry it in a spray bottle and use it on germ-y surfaces. It especially important to carry this with you during cold season! Sleep Mask – this is a must-have if I'm flying somewhere. I use sleep masks to help me block out the light and really tune out. I like to put a little essential oil on the mask, then pop in my headphones in and just relax. I'd love to know what you travel with. Any must-haves that I missed? Let me know in the comments below! Thanks for the tips. I made the granola bars and they taste very nice. They will be my favourite companions from now on. I wonder if you could make a granola bar with brown rice. instead of oats. I have a lot of brown rice to use. You are so awesome!,,, Thank you. Don’t forget your Bible, His word is also essential!. Have a wonderful and safe trip. OMG!! you could not have posted this at the most perfect time!!! I am getting married soon and will be going to Mexico fr my honeymoon! I have been very strict with my meal plans and eating healthy for the past year or so and this is the 1st time I am traveling overseas without being prepared at all so I am so nevous! I want to have fun and relax with my eating but also want to continue to feel good, not have any stomach issue and gain weight and such. So i was unsure about what I am able to pack to hel pprepare me. Do you know are these items allowed in my carry along bag? I was thinking of bringing some protein packets and healthy fod bars , even thinking if only I could bring a can of chickpeas or a block of tempeh! haha…. what is allowed to cross the boarder? U ROCK! First….CONGRATS! So happy for you! And your honeymoon is going to be amazing I’m sure! So you can bring this stuff across the border – it’s really only raw fruits and veggies. I don’t think they would care about the green juice powder though. 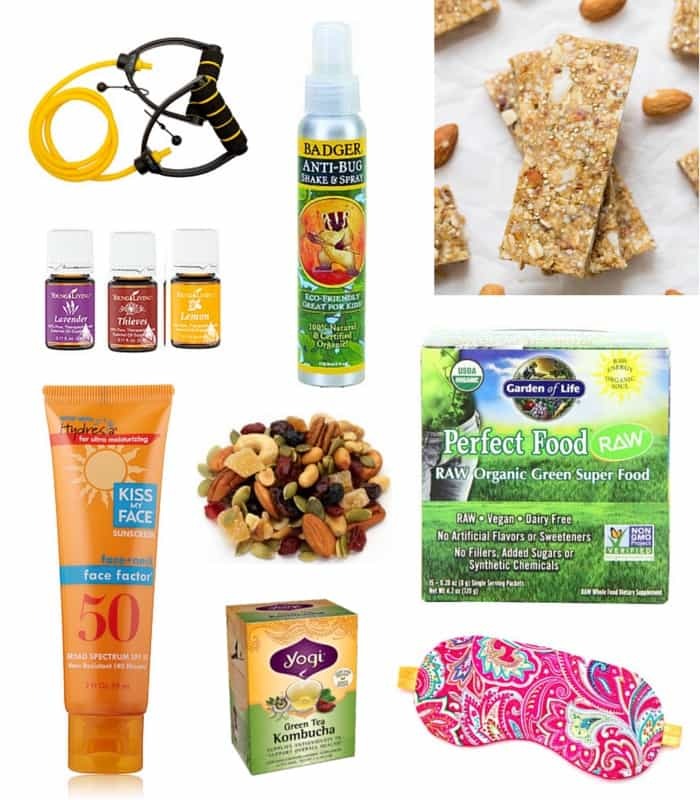 I’m putting most of this stuff in my suitcase and then just carrying on what I need – some trail mix, a granola bar or two, a green juice powder and some tea. Everything else I’ll just enjoy while I’m there.